If I remember right, TJ’s is the home of Kyle’s favorite burger. So that was my motivation when I ate there. 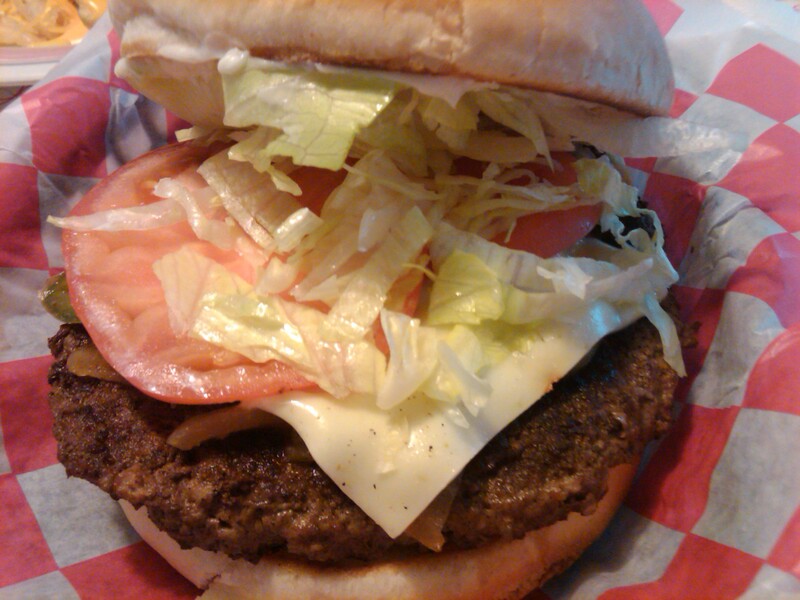 I looked on the menu and decided on the jalapeno burger,which has grilled jalapenos and onions with pepperjack cheese, lettuce, tomato and mayo. And the menu’s a little confusing, but I don’t think fries come with their burgers. I saw they had cheese fries, so I ordered those. And I was charged for the menu price of the burger plus the menu price of the cheese fries, so I THINK you order your sides separately. The place was pretty cool inside. Kind of an old fashioned looking diner, and a place I would like to go late at night to study or read. But I think the place is only open until 9:00. So that’s not really realistic. But that’s legit. I wouldn’t want to work that late, either. The service was very friendly. And it wasn’t exactly fast food, but I’m not complaining. I hate rushed meals. The cheese fries were awesome! 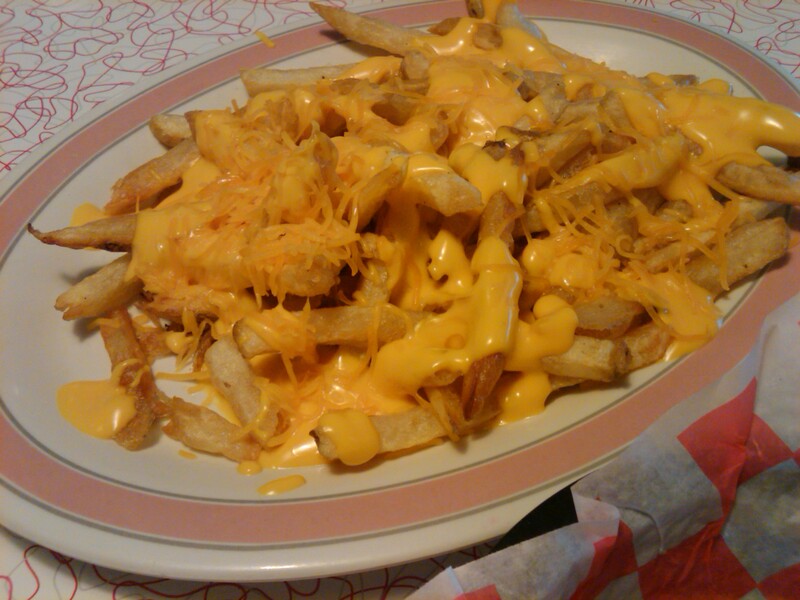 I mean, we all know I’ll hit on anything con queso, but I’ve had bad cheese fries before. These get my blessing, and are on my list of things I daydream about semi-regularly. 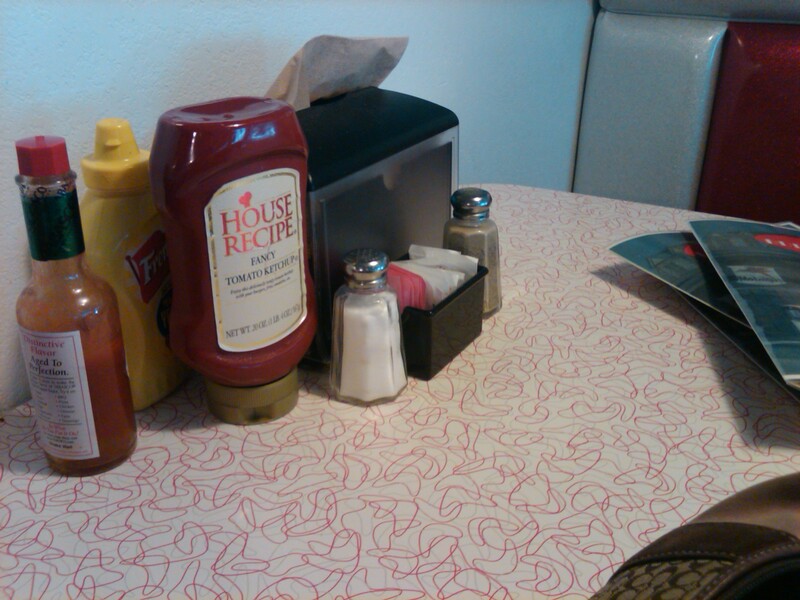 The hamburger was really good and more than enough, but I wasn’t a fan of the grilled onions and jalapenos. I’m not sure why. They had a weird smoky taste that I wasn’t a fan of. I took them off the burger, though, and it seemed to do the trick. Overall, good experience, good food, good service. Pop is kind of pricey. But I think that at most places anymore. I can’t figure out why the price of pop’s going up so much compared to other food prices. But, I digress. Diner ambiance. Am I the only one who feels soothed? I think these bad boys had cheese sauce AND shredded cheddar. SO delicious. My heart rate is increasing just looking at this picture. Mmmm, I could use a burger rigth now. 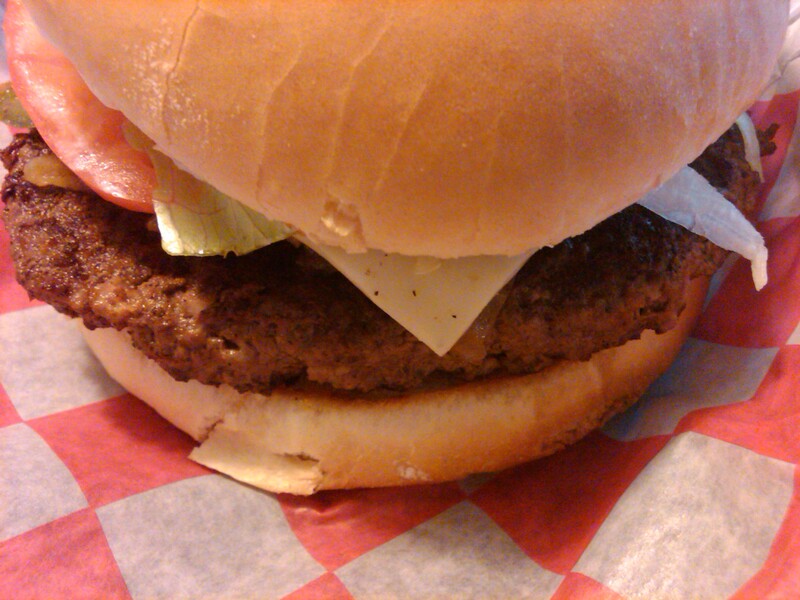 I am a regular of the “old” TJs and like their burgers. It will interesting to see if they are the same quality at the new place. Will be going there next Thursday. Thanks for the great website. It is the best place to visit for useful reviews. that are fun to read. Like the pics too. Keep it up. Ordered the standard cheesburger, no mayo and large fries. Only complaint is they dont have a good bottled root beer.. If they did I would order.. just cant do the standard fountain drinks so I get water and lemon. You’ve convinced me! I’m definitely going to try it again! The woman who is the manager was a regular server at the original TJs. She has short blonde hair and is 40 something. Boss put her in charge of the store because she loves customers and serious about quality. Make sure you talk to her and tell her what you want in your order… she will make sure you are satisfied. Shes a pro.. knows how to take care of customers… Enjoy! Let us know how it went.